On-board diagnostics (OBD) is an automotive term referring to a vehicle's self-diagnostic and reporting capability. OBD systems give the vehicle owner or repair technician access to the status of the various vehicle subsystems. The amount of diagnostic information available via OBD has varied widely since its introduction in the early 1980s versions of on-board vehicle computers. 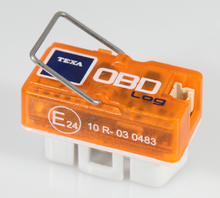 Early versions of OBD would simply illuminate a malfunction indicator light or "idiot light" if a problem was detected but would not provide any information as to the nature of the problem. 1968: Volkswagen introduces the first on-board computer system with scanning capability, in their fuel-injected Type 3 models. 1978: Datsun 280Z On-board computers begin appearing on consumer vehicles, largely motivated by their need for real-time tuning of fuel injection systems. Simple OBD implementations appear, though there is no standardization in what is monitored or how it is reported. 1980: General Motors implements a proprietary interface and protocol for testing of the Engine Control Module (ECM) on the vehicle assembly line. The 'assembly line diagnostic link' (ALDL) protocol broadcasts at 160 bit/s. Implemented on California vehicles for the 1980 model year, and the rest of the United States in 1981. In most cases, the ECM (Engine Control Module) can be made to display DTCs (Diagnostic Trouble Code(s)) as a flashing pattern on the CEL (Check Engine Lamp) or MIL (Malfunction Indicator Lamp). A PC based Software package called WinALDL will listen to the CLCC (Closed Loop Carburetor Control) and early CLC EFI datastreams over a fairly easy to construct interface cable that converts the 160 baud TTL serial data being transmitted by the ECM to RS232 or USB serial data but there is not much information transmitted by these early ECMs. 1986: An upgraded version of the ALDL protocol appears which communicates at 8192 bit/s with half-duplex UART signaling. This protocol is defined in GM XDE-5024B. 1988: The Society of Automotive Engineers (SAE) recommends a standardized diagnostic connector and set of diagnostic test signals. 1991: The California Air Resources Board (CARB) requires that all new vehicles sold in California in 1991 and newer vehicles have some basic OBD capability. These requirements are generally referred to as "OBD-I", though this name is not applied until the introduction of OBD-II. The data link connector and its position are not standardized, nor is the data protocol. 1994: Motivated by a desire for a statewide emissions testing program, the CARB issues the OBD-II specification and mandates that it be adopted for all cars sold in California starting in model year 1996 (see CCR Title 13 Section 1968.1 and 40 CFR Part 86 Section 86.094). The DTCs and connector suggested by the SAE are incorporated into this specification. 2001: The European Union makes EOBD mandatory for all gasoline (petrol) vehicles sold in the European Union, starting in MY2001 (see European emission standards Directive 98/69/EC). 2008: Certain light vehicles in China are required by the Environmental Protection Administration Office to implement OBD (standard GB18352) by July 1, 2008. Some regional exemptions may apply. 2010: HDOBD (heavy duty) specification is made mandatory for selected commercial (non-passenger car) engines sold in the United States. GM's ALDL (Assembly Line Diagnostic Link) is a General Motors proprietary onboard diagnostic interface that started with the late 1970s and early 1980s CLCC (Closed Loop Carburetor Control) and early GM EFI systems. There is an appearance of standardization because the diagnostic jack didn't change over the years ALDL was utilized by GM. GM North America used a proprietary 12 position Metripack 280 diagnostic jack. GM Australia Holden used a 6 position Metripack 280 diagnostic jack. The GM Europe Opel and Vauxall used a 10 position Metripack 280 diagnostic jack. ALDL was not a standard. It was actually extremely fragmented. The information exchange changed with each powertrain control module (aka PCM, ECM, ECU). (A PCM integrates transmission and engine control on one Processing unit. ECM/ECU are engine control only with a separate TCM (Transmission Control Module) if needed.) While ALDL is the closest thing to standard on-board diagnostics prior to 1991 ALDL was not a standard. ALDL was even fragmented within GM brands, models, and model years. Trim levels in the same model year, division, and nameplate can use different communications. Different versions presented differences in diagnostic jack pin-outs, data protocols, and data rates (this is the reason for the ″Mask″ files needed for aftermarket software communication). Earlier versions used 160 bit/s, while later versions went up to 8192 bit/s and used bi-directional communications to the PCM or ECM/TCM. ALDL on 1991 and later California emissions GM vehicles met the 1991 and later California OBD-I communication standard. This does not mean that ALDL is OBD-I. OBD-I was an early 1990s California-only mandate, not a United States federal mandate. It was not used on non-California emissions vehicles. Some Asian, European, and North American diagnostic ports are sometimes incorrectly referred to as ALDL. A small number of vehicles manufactured before 1996 from other manufacturers used the GM Delphi Electronics engine and powertrain controllers; however, these used a modified ALDL communication protocol. Most did not and there was not a homogeneous name for these other proprietary diagnostic protocols and interface ports. Ford EEC, Toyota DLC, Chrysler, Nissan, Volkswagen, and others used their own on-board Diagnostics protocols and connectors, and are also not OBD-I compliant outside California. A 1991 and later California standard. It is not a USA Federal standard. The regulatory intent of OBD-I was to encourage auto manufacturers to design reliable emission control systems that remain effective for the vehicle's "useful life". The Diagnostic Trouble Codes (DTCs) of OBD-I vehicles can usually be found without an expensive 'scan tool'. Each manufacturer used their own diagnostic link connector (DLC), DLC location, DTC definitions, and procedure to read the DTCs from the vehicle. DTCs from OBD-I cars are often read through the blinking patterns of the 'Check Engine Light' (CEL) or 'Service Engine Soon' (SES) light. By connecting certain pins of the diagnostic connector, the 'Check Engine' light will blink out a two-digit number that corresponds to a specific error condition. The DTCs of some OBD-I cars are interpreted in different ways, however. Cadillac (gasoline) fuel-injected vehicles are equipped with actual on-board diagnostics, providing trouble codes, actuator tests and sensor data through the new digital Electronic Climate Control display. Holding down 'Off' and 'Warmer' for several seconds activates the diagnostic mode without the need for an external scan tool. Some Honda engine computers are equipped with LEDs that light up in a specific pattern to indicate the DTC. General Motors, some 1989–1995 Ford vehicles (DCL), and some 1989–1995 Toyota/Lexus vehicles have a live sensor data stream available; however, many other OBD-I equipped vehicles do not. OBD-I vehicles have fewer DTCs available than for OBD-II equipped vehicles. OBD 1.5 refers to a partial implementation of OBD-II which General Motors used on some vehicles in 1994 and 1995. OBD 1.5 is a colloquialism. GM did not use the term OBD 1.5 in the documentation for these vehicles; they simply have an OBD and an OBD-II section in the service manual. Most of these 1994 & 1995 vehicles were simply 8196 baud ALDL serial data on the #9 vendor option terminal of the J1962 Jack that was formally adopted for OBD II starting in 1996. This hybrid system was present on the GM H-body cars in 94–95, W-body cars (Buick Regal, Chevrolet Lumina ('95 only), Chevrolet Monte Carlo ('95 only), Pontiac Grand Prix, Oldsmobile Cutlass Supreme) in 94–95, L-body (Chevrolet Beretta/Corsica) in 94–95, Y-body (Chevrolet Corvette) in 94–95, on the F-body (Chevrolet Camaro and Pontiac Firebird) in 95 and on the J-Body (Chevrolet Cavalier and Pontiac Sunfire) and N-Body (Buick Skylark, Oldsmobile Achieva, Pontiac Grand Am) in 95 and 96 and also on '94–'95 Saab vehicles with the naturally aspirated 2.3. GM used at least two (#9 & #12) of what became seven "Vendor Option" terminals (1, 8, 9, 11, 12, 13) along with #4 Chassis Ground and #16 Battery Power in the formally accepted J1962 Jack. While OBD II interfaces will not communicate with these controllers they will not be damaged by plugging into these jacks either. An OBD 1.5 has also been used on Mitsubishi cars of '95 '97 vintage, and in the Ford Scorpio since 95. Codes retrieved are still 2 digit codes which still require an ALDL scan tool, a laptop and USB-ALDL interface with a properly pinned J1962 ALDL plug, or a GM Tech II. Flash codes can be retrieved on 1994–1995 Corvettes by shorting #12-Vendor Option to #4 Chassis Ground. OBD-II is an improvement over OBD-I in both capability and standardization. The OBD-II standard specifies the type of diagnostic connector and its pinout, the electrical signalling protocols available, and the messaging format. It also provides a candidate list of vehicle parameters to monitor along with how to encode the data for each. 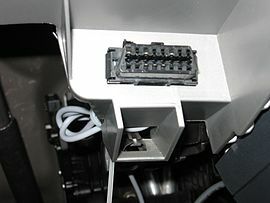 There is a pin in the connector that provides power for the scan tool from the vehicle battery, which eliminates the need to connect a scan tool to a power source separately. However, some technicians might still connect the scan tool to an auxiliary power source to protect data in the unusual event that a vehicle experiences a loss of electrical power due to a malfunction. Finally, the OBD-II standard provides list of standardized DTCs. As a result of this standardization, a single device can query the on-board computer(s) for these parameters in any vehicle. 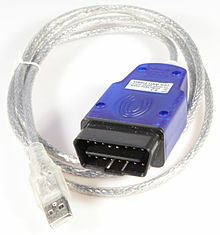 OBD-II standardization was prompted to simplify diagnosis of increasingly complicated emissions equipment, and though only emission-related codes and data are required to be transmitted through it according to U.S. legislation, most manufacturers have made the OBD-II Data Link Connector the main connector in the vehicle through which all systems are diagnosed and reprogrammed. OBD-II Diagnostic Trouble Codes are 4-digit, preceded by a letter: P for engine and transmission (powertrain), B for body, C for chassis, and U for network. Manufacturers may also add custom data parameters to their specific OBD-II implementation, including real-time data requests as well as trouble codes. The SAE J1962 specification provides for two standardized hardware interfaces, called type A and type B. Both are female, 16-pin (2x8), D-shaped connectors, and both have a groove between the two rows of pins, but type B's groove is interrupted in the middle. This prevents the insertion of a type A male plug into a type B female socket while allowing a type B male plug to be inserted into a type A female socket. Ford: DCL(+) Argentina, Brazil (pre OBD-II) 1997–2000, USA, Europe, etc. Ford: DCL(-) Argentina, Brazil (pre OBD-II) 1997–2000, USA, Europe, etc. 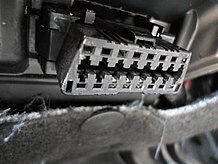 Unlike the OBD-I connector, which was sometimes found under the hood of the vehicle, the OBD-II connector is required to be within 2 feet (0.61 m) of the steering wheel (unless an exemption is applied for by the manufacturer, in which case it is still somewhere within reach of the driver). 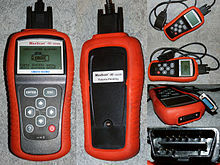 The EOBD (European on board diagnostics) regulations are the European equivalent of OBD-II, and apply to all passenger cars of category M1 (with no more than 8 passenger seats and a Gross Vehicle Weight rating of 2500 kg or less) first registered within EU member states since 1 January 2001 for petrol (gasoline) engined cars and since 1 January 2004 for diesel engined cars. For newly introduced models, the regulation dates applied a year earlier – 1 January 2000 for petrol and 1 January 2003 for diesel. For passenger cars with a Gross Vehicle Weight rating of greater than 2500 kg and for light commercial vehicles, the regulation dates applied from 1 January 2002 for petrol models, and 1 January 2007 for diesel models. In 2017, all previous standards were revoked because there were more than 24 standards produced over 35 years. The new document supplanted all previous versions. The following two characters would refer to the individual fault within each subsystem. The ADR 79/01 vehicle standard (Australian Design Rule 79/01 – Emission Control for Light Vehicles, 2005) is the Australian equivalent of OBD-II. It applies to all vehicles of category M1 and N1 with a gross Vehicle Weight rating of 3500 kg or less, registered from new within Australia and produced since 1 January 2006 for petrol (gasoline) engined cars and since 1 January 2007 for diesel engined cars. For newly introduced models, the regulation dates applied a year earlier – 1 January 2005 for petrol and January 2006 for diesel. The ADR 79/01 standard was supplemented by the ADR 79/02 standard which imposed tighter emissions restrictions, applicable to all vehicles of class M1 and N1 with a gross vehicle weight rating of 3500 kg or less, from 1 July 2008 for new models, 1 July 2010 for all models. The technical implementation of this standard is essentially the same as OBD-II, with the same SAE J1962 diagnostic link connector and signal protocols being used. ISO 9141-2. This protocol has an asynchronous serial data rate of 10.4 kbit/s. It is somewhat similar to RS-232; however, the signal levels are different, and communication happens on a single, bidirectional line without additional handshake signals. ISO 9141-2 is primarily used in Chrysler, European, and Asian vehicles. OBD-II provides access to data from the electronic control unit (ECU) and offers a valuable source of information when troubleshooting problems inside a vehicle. The SAE J1979 standard defines a method for requesting various diagnostic data and a list of standard parameters that might be available from the ECU. The various parameters that are available are addressed by "parameter identification numbers" (parameter IDs or PIDs) which are defined in J1979. For a list of basic PIDs, their definitions, and the formula to convert raw OBD-II output to meaningful diagnostic units, see OBD-II PIDs. Manufacturers are not required to implement all PIDs listed in J1979 and they are allowed to include proprietary PIDs that are not listed. The PID request and data retrieval system gives access to real time performance data as well as flagged DTCs. For a list of generic OBD-II DTCs suggested by the SAE, see Table of OBD-II Codes. Individual manufacturers often enhance the OBD-II code set with additional proprietary DTCs. Service $01 is used to identify what powertrain information is available to the scan tool. Service $02 displays Freeze Frame data. Service $03 lists the emission-related "confirmed" diagnostic trouble codes stored. It displays exact numeric, 4 digit codes identifying the faults. Service $04 is used to clear emission-related diagnostic information. This includes clearing the stored pending/confirmed DTCs and Freeze Frame data. Service $06 is a request for on-board monitoring test results for continuously and non-continuously monitored system. There are typically a minimum value, a maximum value, and a current value for each non-continuous monitor. Service $07 is a request for emission-related diagnostic trouble codes detected during current or last completed driving cycle. It enables the external test equipment to obtain "pending" diagnostic trouble codes detected during current or last completed driving cycle for emission-related components/systems. This is used by service technicians after a vehicle repair, and after clearing diagnostic information to see test results after a single driving cycle to determine if the repair has fixed the problem. Service $08 could enable the off-board test device to control the operation of an on-board system, test, or component. CVN (calibration verification number): Number used to verify the integrity of the vehicle software. The manufacturer is responsible for determining the method of calculating CVN(s), e.g. using checksum. Diesel engine : NMHC catalyst, NOx reduction catalyst, NOx absorber particulate matter filter, exhaust gas sensor, EGR system, VVT system, boost pressure control, fuel system. Service $0A lists emission-related "permanent" diagnostic trouble codes stored. As per CARB, any diagnostic trouble codes that is commanding MIL on and stored into non-volatile memory shall be logged as a permanent fault code. Multi-brand vehicle diagnostics system handheld Autoboss V-30 with adapters for connectors of several vehicle manufacturers. Mobile device applications allow mobile devices such as cell phones and tablets to display and manipulate the OBD-II data accessed via USB adaptor cables, bluetooth or WiFi adapters plugged into the car's OBD II connector. A number of new devices allow the vehicle's OBD port to stream data directly to the Internet via a cellular connection. Typical simple USB KKL Diagnostic Interface without protocol logic for signal level adjustment. A PC-based OBD analysis tool that converts the OBD-II signals to serial data (USB or serial port) standard to PCs or Macs. The software then decodes the received data to a visual display. 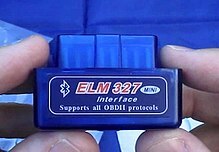 Many popular interfaces are based on the ELM or STN OBD Interpreter ICs, both of which read all five generic OBD-II protocols. Some adapters now use the J2534 API allowing them to access OBD-II Protocols for both cars and trucks. TEXA OBD log. Small data logger with the possibility to read out the data later on PC via USB. In the United States, many states now use OBD-II testing instead of tailpipe testing in OBD-II compliant vehicles (1996 and newer). Since OBD-II stores trouble codes for emissions equipment, the testing computer can query the vehicle's onboard computer and verify there are no emission related trouble codes and that the vehicle is in compliance with emission standards for the model year it was manufactured. Driver's supplementary vehicle instrumentation is installed in a vehicle in addition to that provided by the vehicle manufacturer and intended for display to the driver during normal operation. This is opposed to scanners used primarily for active fault diagnosis, tuning, or hidden data logging. Instrumentation may take the form of dedicated trip computers, carputer or interfaces to PDAs, smartphones, or a GPS navigation unit. As a carputer is essentially a PC, the same software could be loaded as for PC-based scan tools and vice versa, so the distinction is only in the reason for use of the software. OBD II is no longer only used by professionals and hobbyists to repair vehicles. OBD II information is commonly used by vehicle telematics devices that perform fleet tracking, monitor fuel efficiency, prevent unsafe driving, as well as for remote diagnostics and by pay-as-you-drive insurance. Although originally not intended for the above purposes, commonly supported OBD II data such as vehicle speed, RPM, and fuel level allow GPS-based fleet tracking devices to monitor vehicle idling times, speeding, and over-revving. By monitoring OBD II DTCs a company can know immediately if one of its vehicles has an engine problem and by interpreting the code the nature of the problem. OBD II is also monitored to block mobile phones when driving and to record trip data for insurance purposes. Since 2010, Title 13 of the California Code of Regulations 1971.1 allows heavy duty (class 8) diesel trucks to use either SAE J1939-73 OBD protocols with the J1939-13 round OBD connector, or SAE J1979 OBD protocols with the J1962 OBD connector (same as passenger cars). Heavy trucks that use J1979/J1962 (for example Mack and Volvo Trucks North America) typically use 29 bit CAN identifiers. There have been reports of thieves using specialist OBD reprogramming devices to enable them to steal cars without the use of a key. The primary causes of this vulnerability lie in the tendency for vehicle manufacturers to extend the bus for purposes other than those for which it was designed, and the lack of authentication and authorization in the OBD specifications, which instead rely largely on security through obscurity. The National Highway Traffic Safety Administration has demonstrated the ability to take over certain functions through wires to the car's control center. In 2012, vehicles produced by BMW, Porsche, Opel, Renault, Mercedes, Volkswagen and Toyota were stolen by programming a blank key fob to start the car through the OBD connection. BMW offered all owners a free fix through a software update, and all newer vehicles have upgraded software that fixed this vulnerability. Wikimedia Commons has media related to Obd2. 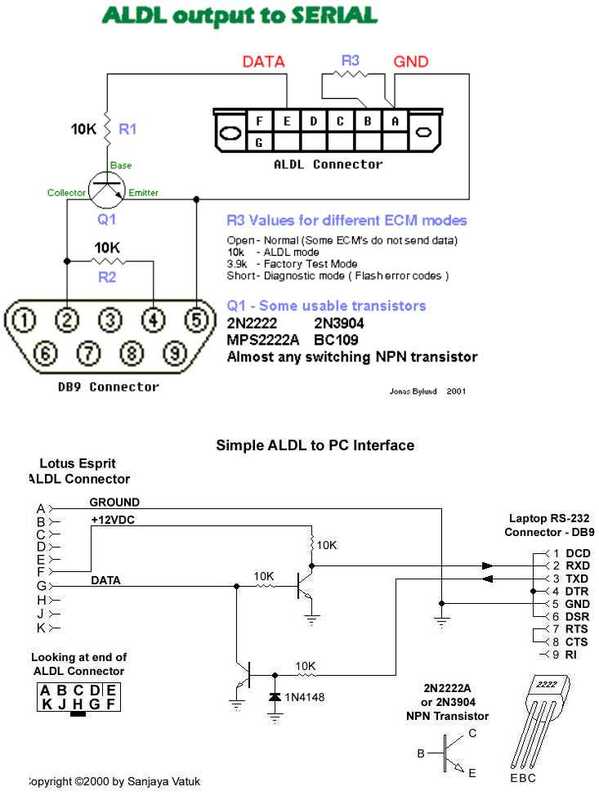 ^ "ALDL output to SERIAL" (JPG). Static.moates.net. Retrieved 4 November 2016. ^ "Uber-easy DIY USB ALDL Cable". Gearhead-efi.com. Retrieved 4 November 2016. ^ McCord, Keith (2011). Automotive Diagnostic Systems: Understanding OBD I and OBD II. CarTech Inc. p. 8. ISBN 978-1-934709-06-1. ^ "Frequently Asked Questions (FAQ) About On-Board Diagnostic II (OBD II) Systems". Arb.ca.gov. Retrieved 4 November 2016. ^ "DIRECTIVE 98/69/EC OF THE EUROPEAN PARLIAMENT AND OF THE COUNCIL : 13 October 1998 : Relating to measures to be taken against air pollution by emissions from motor vehicles and amending Council Directive 70/220/EEC (OJ L 350, 28.12.1998, p. 1)" (PDF). Eur-lex.europa.eu. Retrieved 4 November 2016. ^ 刘立媛. "Catalogue for Newly-released Environmental Regulations and Standards". English.mep.gov.cn. Retrieved 4 November 2016. ^ "OBD_百度百科". Baike.baidu.com. 1 August 2016. Retrieved 4 November 2016. ^ "Google Translate". Translate.google.com. Retrieved 4 November 2016. ^ Peter Gargano. "Reading GM's 160 baud ALDL Data Stream with a Standard PC Serial Port". Techedge.com.au. Retrieved 4 November 2016. ^ "Prado 90 OBDI vs OBDII TDCL vs MOBD". Pradopoint.com. Retrieved 4 November 2016. ^ "OBD Diagnostics : Pre-Check" (PDF). wlap.org. Retrieved 4 November 2016. ^ "Supported Vehicle Interfaces". openxcplatform.com. Retrieved 4 November 2016. ^ "What is data stream M-OBD of Asian Toyota vehicle?". Scantool.net. Retrieved 4 November 2016. ^ "Emission Standards: USA: On-Board Diagnostics (California)". Dieselnet.com. Retrieved 4 November 2016. ^ 1994 Corvette Service Manual, Book 2. General Motors Corporation. December 1993. pp. 6E3–A–166 : 6E3–A–223. ^ 1994 Corvette Service Manual, Book 2. General Motors Corporation. Dec 1993. pp. 6E3–A–11. ^ "EEC-IV Code Reader". Fordscorpio.co.uk. 14 January 2006. Retrieved 4 November 2016. ^ a b "Pulling Codes on your Corvette without a code reader". Neilkline.com. Retrieved 4 November 2016. ^ a b c d e f "Vehicle Interface – OpenXC". Openxcplatform.com. Retrieved 4 November 2016. ^ "Directive 98/69/EC of the European Parliament". Publications Office of the European Parliament. ^ "supplementing Regulation (EC) No 715/2007 of the European Parliament and of the Council on type-approval of motor vehicles with respect to emissions from light passenger and commercial vehicles (Euro 5 and Euro 6) and on access to vehicle repair and maintenance information". Publications Office of the European Parliament. ^ "OBD-II Check Engine Light Trouble Codes". Obd-codes.com. Retrieved 4 November 2016. ^ "Vehicle Standard (Australian Design Rule 79/01 – Emission Control for Light Vehicles) 2005". Australian Government ComLaw. ^ "Vehicle Standard (Australian Design Rule 79/02 – Emission Control for Light Vehicles) 2005". Australian Government ComLaw. ^ "Autoboss 30 Diagnostic Coverage List" (PDF). Autobossuk.co.uk. Retrieved 4 November 2016. ^ "OBD Interpreter ICs | OBD to UART | OBD Solutions". Obdsol.com. Retrieved 4 November 2016. ^ "Snapshot®". Progressive.com. Retrieved 4 November 2016. ^ "EOBD for General Periodic Inspection". Diagnoseapparatuur.nl. 1 April 2012. Retrieved 4 November 2016. ^ Bright, Peter (15 May 2010). "Car hacks could turn commutes into a scene from Speed". Ars Technica. Retrieved 23 Aug 2012. ^ Koscher, Karl (May 2010). Experimental Security Analysis of a Modern Automobile. 2010 IEEE Symposium on Security and Privacy. IEEE. doi:10.1109/SP.2010.34. Retrieved 24 Feb 2016. ^ Marks, Paul (17 July 2013). "$25 gadget lets hackers seize control of a car". New Scientist. Retrieved 5 November 2013. ^ a b "Video: Key fob reprogrammers steal BMW in 3 mins". PistonHeads.com. 2 July 2012. Retrieved 4 November 2016. ^ Van den Brink, Rob. "Dude, Your Car is Pwnd" (PDF). SANS Institute. Archived from the original (PDF) on 23 August 2014. Retrieved 5 August 2015. ^ Travers, Jim (7 May 2015). "Kee". Consumer Reports. Retrieved 29 May 2015. ^ Titcomb, James (6 July 2012). "Alarming moment thieves silently steal BMW by programming a blank key that cost just £70 in new crime trend sweeping Britain". London: Daily Mail. Retrieved 23 August 2012. ^ Torchinsky, Jason (6 July 2012). "Watch Hackers Steal A BMW In Three Minutes". Jalopnik. Retrieved 28 August 2012. ^ Fowler, Steve (September 14, 2012). "BMW owners offered fix for hi-tech theft". Auto Express. Retrieved 20 April 2017. Birnbaum, Ralph and Truglia, Jerry. Getting to Know OBD II. New York, 2000. ISBN 0-9706711-0-5. SAE International. On-Board Diagnostics for Light and Medium Duty Vehicles Standards Manual. Pennsylvania, 2003. ISBN 0-7680-1145-0. OBD2 Vehicle Plug Pinouts including compatibility lists Manufacturer Specific OBD-II diagnostics pinouts and compatibility information. Is My Car OBD2 Compatible and Supported by OBD Scanner/Software? Is My Car OBD2 Compatible and Supported by OBD Scanner/Software?